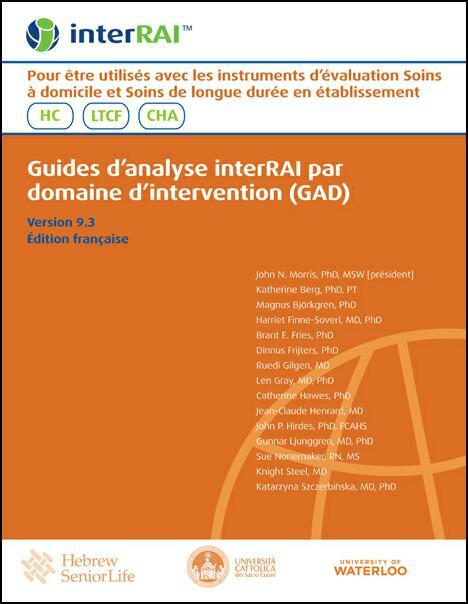 "Guides d’analyse interRAI par domaine d’intervention (GAD): Pour être utilisés avec les instruments d’évaluation Soins à domicile et Soins de longue durée en établissement" is the French translation of the "interRAI Clinical Assessment Protocols for Use with Community and Long-Term Care Assessment Instruments" contains country-specific examples for France. interRAI Clinical Assessment Protocols for Use with Community and Long-Term Care Assessment Instruments, known as CAPs, are designed to help the assessor interpret systematically all the information recorded with the instruments' assessment forms. CAPs are not intended to automate care planning; rather, they help the clinician focus on key issues identified during the assessment process, so that decisions as to whether and how to intervene can be explored with the individual. This book contains the Clinical Assessment Protocols (CAPs) for use with the following interRAI assessment instruments: Home Care (HC), Long-Term Care Facilities (LTCF), Community Health (CHA), and the Assisted Living Supplement to Community Health (CHA-AL). The CAPs in this book can also be used with the prior generation of the interRAI assessment instruments used in long-term care facilities (the MDS 2.0) and home care (the HC 2.0). This book includes introductory material followed by the CAPs themselves, which are organized into the four broad areas of Functional Performance, Cognition/Mental Health, Social Life, and Clinical Issues.